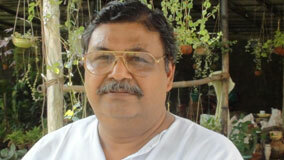 Sri Dinesh Rawat is a landscaper designer and developer with a difference. He has done his depth study in ornamental plants and underwent tannings in U.S.A, Australia, Thailand, and Sri lanka. He has attended several Conference and Seminars in the field of Palm, Ornamental Plants and Landscaping at Singapore, Australia, USA and Sri Lanka. He has also attended Green House Management course at Horticulture Training Center, Pune . He is very passionate about landscaping and motivate people to “Go Green” and to “Live in Harmony Nature”. To fulfill his Mission and Vision he has developed Green Mall near Kolkata and about 30 acres of land in under plantation. He has also authored books like “Palm for India” and “Green Your Surroundings”, provided several documentaries, produced two audio albums of environmental songs “Prakriti Ki Pukar” & “PrakritiBandhana”. He offers his consultancy to various organization. He has signed an MOU with India Botanical Garden Howrah to Rejuvinate their Palm Collection. He has introduced many new palms in India and is instrumental in introducing Palms in landscaping in India.